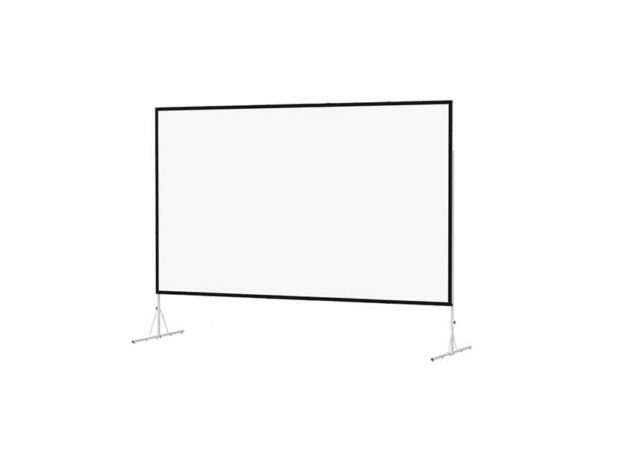 This large scale 12′ x 6’9″ portable screen is a suitable for use with all of our projectors. The Fastfold frame is quick and easy to erect by the release catches and sturdy aluminium frame sections. The frame locks in place to the T-bar feet. The frame has heavy duty popper studs attach both the front or back of the projector cloth. The snap in place sections can be put up in minutes, and the process means that there is no chance of any of the pieces being lost or misplaced. This screen is perfect for a wide range of events. To hire a projector screen for your next event, contact ITR for more information.